…it really feels as if you are there with the characters. I think I would really love to visit the Renaissance Village, it sounds like a very intriguing and interesting place…The writing, as always with Jim and Joyce, was excellent and made this a very easy read. I would love to go to the Renaissance Village it sounds fun to visit and a hoot to live and work there. I really love the mix of paranormal, magic and mystery of this series, as well as the setting. The Lavene’s really know how to craft a great mystery, that is fun and keeps you guessing. I love Jessie and the other characters of the Renaissance Faire series and I am always so excited to be able to spend time with them in each book of the series. I really enjoyed “Bewitching Boots”. It was fun, enjoyable, humorous, and kept me guessing. 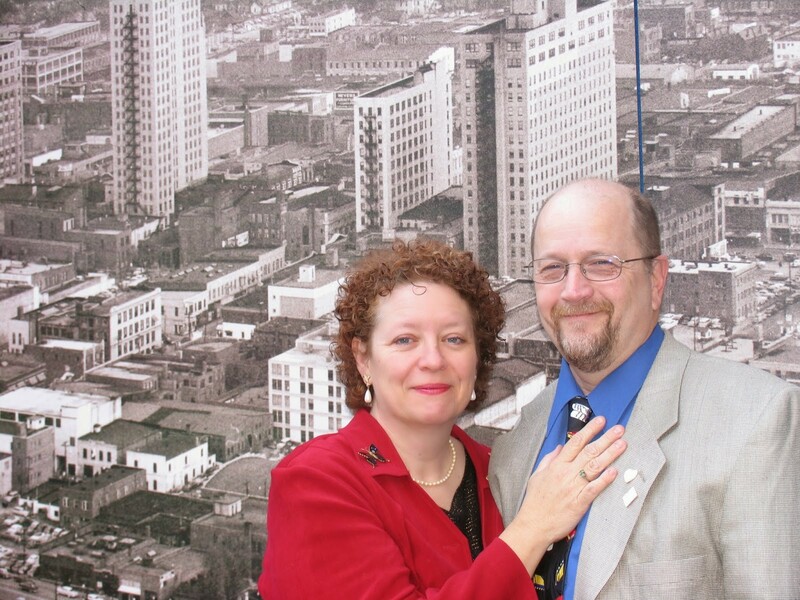 Jim and Joyce are master storytellers that create a Renaissance Fair so real in the stories that you will want to get into costume and join in the fun and even solve the murder. 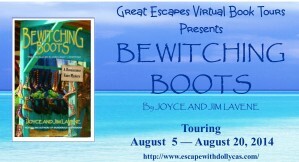 “Bewitching Boots” is part fantasy, part reality; part murder, part mayhem, and full-on, flat-out entertaining! The authors need to distill and bottle whatever it is that keeps these wonderful stories flowing out of their quills (a little Renaissance humor there). Joyce and Jim Lavene are amazing storytellers; may they continue for a long, LONG time. 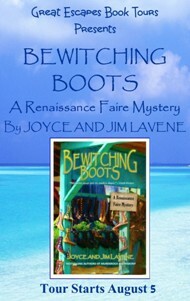 Bewitching Boots by Joyce & Jim Lavene is another fantastic installment in the fun Renaissance Faire Mystery series. I devoured this book. This book was incredible so much going on. Jessie is thrilled when she finds Bill Warren, an old fashioned shoemaker, and he agrees to come back to Renaissance Village with her. She’s not so thrilled when claims to have elf magic, and he falls for Princess Isabelle. The dancing slippers Bill makes for Isabelle make him a suspect when the princess takes a leap from the castle terrace. Now, Jessie must find the lady or lord who helped the princess with her last dance before she loses her star attraction. 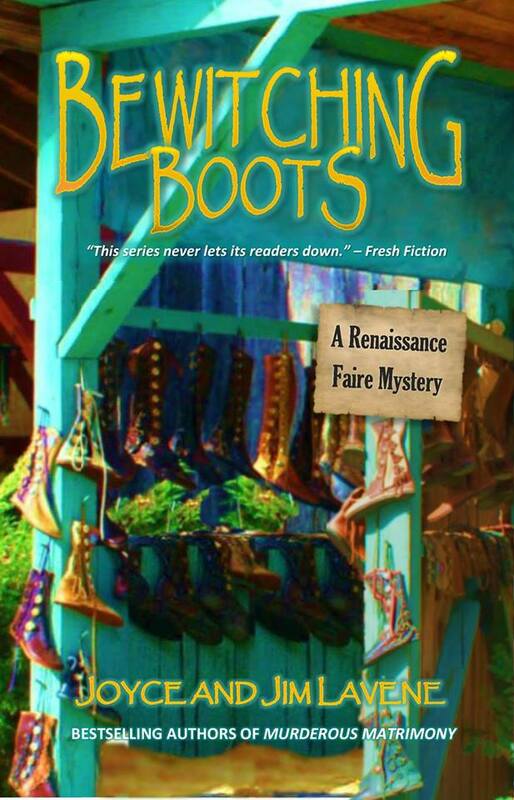 I love the Renaissance Faire Mystery series and eagerly await each new book. They are the funniest and have the quirkiest characters. When is the book coming out? Can’t find it anywhere.